With the release of the Hollywood movie, Flags of Our Fathers, this month's update focuses on Iwo Jima. With emphasis on wrecks & relics on the island, also a Google Earth file to view Iwo's from satellite photography. For me, the most inspiring part about Flags Of Our Fathers is the truth behind event in history. Hopefully, this new movie will also create a renewed interest in World War II Pacific history! Information in Iwo Jima and accounts from visitors to the island. February 23, 1945 Marines of Easy Company, 28th Regiment, 5th Marine Division, hoist the first American flag over Iwo Jima. Later, this flag will be lowered and a replacement raised. Iwo Jima means 'Sulphur Island' in Japanese. Part of the volcano island chain, Iwo Jima is just under five miles long and two and a half miles wide at its widest point and has been described by many as a 'pork chop' shape when viewed from the air. Located south and west of the midpoint between Tokyo and Saipan. See Iwo Jima on Google Earth! Download the exclusive file and open it with Google Earth (free download). See Mount Suribachi, the invasion beaches, the airfields and other famous locations on the island. 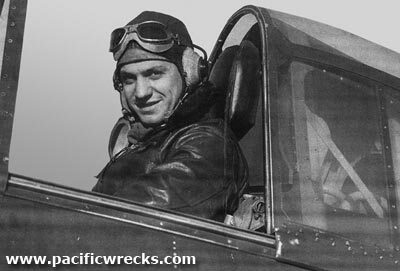 by Justin Taylan This is the story of an American and a Japanese pilot who met in aerial combat. Their deadly aerial engagement began with a moment of humanity – the sight of young man’s face – during the battle over the tiny island of Iwo Jima. More than half-century later, this encounter results in a meeting between former enemies. A Marine veteran wishes to return the wallet of a Japanese soldier killed during the battle. This small leather wallet contains several good luck charms and his personal 'chop' (family name). Photographs of the wallet's contents are presented in hopes the family of this soldier can be located, and the wallet returned. 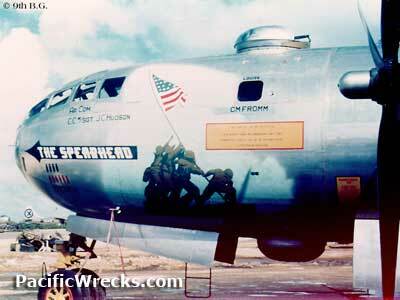 A B-29 with nose art of the second flag raising. Named in appreciation of the Fifth Marine Division by the 21st Bomber Command. Learn the history of this Superfortress and its unique nose art. IOff limits for all but one day a year, few are able to visit Iwo Jima. Photographs by Don MacArthur "I was a platoon sergeant stationed in Tachikawa Japan in early part of the Korean War, and was sent to Iwo Jima for electronic work. I spent two weeks there with no duty, because our project was cancelled when we arrived. I spent many hours exploring the Island and it's caves and bunkers"
Iwo Jima has to be the most significant and at the same time-the hardest to get to. While it holds the same type of meaning to Americans as Gettysburg, Iwo Jima is not a place that you can hop in the car and make a road trip to. Due to an agreement between the American and Japanese government, we and the Japanese can only return once a year. By James Bradley & Ron Powers Flags Of Our Fathers book tells the stories of the six flag raisers who were immortalized by photographer Joseph Rosenthal's famous photograph. The true story of the men and events surrounding the famous photograph. BAR-none, this book is the definitive book on USMC gear. Harlan Glenn has spared no expense on documenting the nuances of the USMC uniforms, equipment and insignia of WWII. Lavishly illustrated with photos of actual equipment studio photos and wartime photos, this book is a work of art as much as it is a reference book. by Cory Graff Prior to the Marine landing on Iwo Jima, a massive aerial assault against the island of Iwo Jima was undertaken by US Navy, and Army Air Force air power. Lavishly illustrated with three to four wartime photographs per page and many maps and wartime documents. Just as a photo book, this book is a worthy addition. This book examines the continuing development of the Corps' organization, its training, tactics, weaponry, and command structure. It details the formation of the 5th and 6th Marine Divisions and the 1st Provisional Marine Brigade, and examines the Corps' performance in the brutal battles on Guam, Peleliu, Iwo Jima, and Okinawa, and its deployment as an occupation force.